Luke & I have been flying hither and yon of late, most recently to Washington DC for the Association of Writers & Writing Programs annual conference, and then to New York City to visit with friends & to see Compulsion at the Public Theatre, starring Mandy Patinkin – who not only inspires me with his singing, acting and advocacy, but connects me to my late father through our many viewings of “Sunday in the Park with George” while he was wheelchair-bound due to ALS. For those unfamiliar with ADA as it relates to access and accommodation regarding certified service dogs, all that a business or service provider or officer of the law is allowed to ask of someone is what function the accompanying assistance dog serves. We are not required to carry around any special papers and the dog does not need any special identification. Luke wears a service dog vest – blue, designating mobility assistance – and he even has a photo ID made by servicedogtags.com. 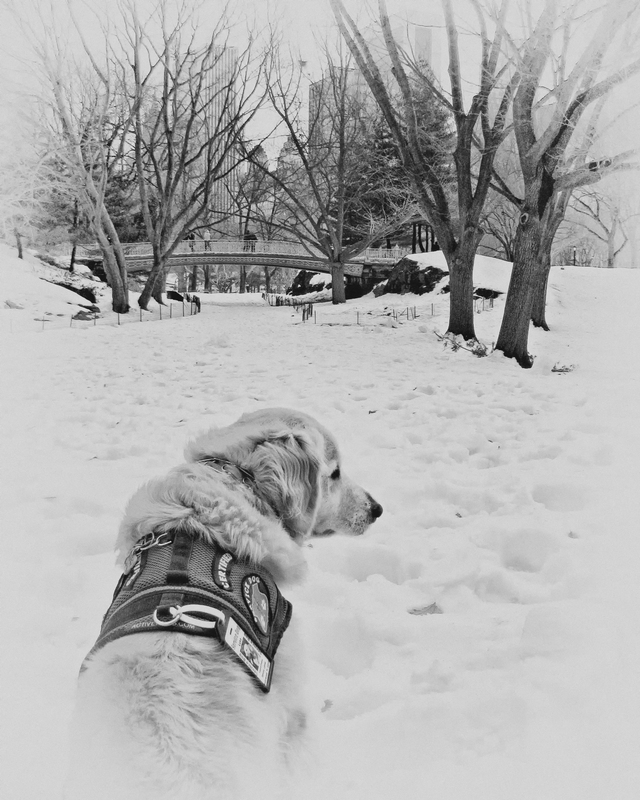 I can’t think of many reasons – save extreme heat or inclement weather – for someone partnered with service dog not to have their dog wear a vest or harness which identifies them readily and easily as a service dog. (I cannot even begin to imagine how much I’d be hassled without Luke wearing his vest!) The photo ID is extremely helpful to me and I’d personally never leave home without it. His photo ID is an added convenience for those folks who further doubt Luke’s official capacity. Luke’s likeness and the words Certified Service Dog along with with my own name spelled out on that plastic tag seem to make all the difference in the world to whether or not we get into a movie theatre, restaurant, etc. I’ve absolutely no doubt that without that photo ID, Jet Blue would’ve bumped us from our flight. But, again, the law doesn’t require a vest, a patch, or harness, and certainly not a photo ID or any kind of special papers. So if you have a service dog, know your rights. And if you work in a capacity that encounters the public in this kind of way, please tell everyone you work with what is and is not legal and appropriate in dealing with those who have service dogs. I’ll be forever in your debt, and you’ll make the lives of people like me So Much Easier. Service dogs go through rigorous training and then a very detailed certification process by a party other than the trainer – and other than the owner, in cases where someone is training her own service dog for herself, for her child or her partner’s use. Once the dog is certified, the idea is that this newly-minted team of human being requiring assistance + trained and devoted service dog providing said assistance, are free to go about daily life encountering as little interference as possible. 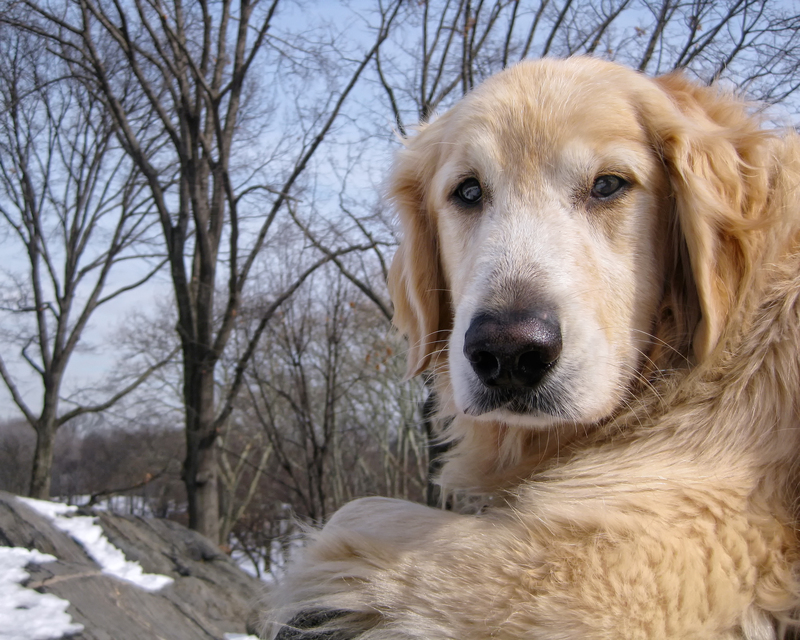 The whole point of partnering someone in need with a service dog is to gift them with independence, safety and freedom. The ability to do what could not be accomplished before, without the help of a service dog – or other people – in attendance. Which is why it’s most unfortunate that once we get out and about in the world with all this independence, freedom, comfort and level of safe-guarding against harm (from falling or seizures, etc.) that we are thwarted so often. Repeatedly. Sometimes every day. Sometimes many times a day. Sometimes so rudely that we cave under the offense and exhaustion of it all. How many times have I had an encounter so thoroughly humiliating and infuriating that I’ve walked away, canceled my errands or plans, and gone home? Too many to count. Not because I’m not empowered, but because I’m already ill and tired and carrying invisible burdens when I go out of my front door. So that when I encounter yet more challenges I’m often without one last shred of gumption to fight – thoroughly depleted emotionally, spiritually, physically. There are only so many battles within each of us on any given day; what the world doesn’t seem to grasp is how many battles the ill and/or disabled endure before (if/when) we leave our houses. After I explained to the Jet Blue agent that there were no special papers and that the ADA makes clear it is illegal to require anything of that nature in order to provide access or accommodation, she accepted the information, apologized, and got me on my way. But then once I boarded the plane – and after everyone else had boarded as well – the doors were held. After almost a half an hour a different Jet Blue agent came on board demanding to see my “documentation” for Luke. So I went through the whole thing, again, while an entire flight of crew and passengers waited for this (quite rude) woman to decide that Luke and I would be allowed to fly. And this was just the first leg of our trip! Once at the hotel in DC there were more issues, mostly from the coffee bar/cafe that didn’t seem to understand even the concept of a service dog, and then from the hotel management who kept insisting how dog-friendly their hotel was/is rather than address the problem so that I could just go in and get my dang cappuccino once or twice a day without coming up against the same brick wall and being asked to leave. Taxi drivers, in general, are uninformed about service dogs. Most refuse to take us, some want to charge extra. One particular gem of a guy waited till the end of the ride to Dulles and attempted to charge me double the fare. In NYC the drivers won’t even stop for me. I have to get a bellman or a stranger to flag a taxi while I stand away and act like I’m not associated with that person. Once the taxi is snagged, my helper holds the door open and beckons us, at which point the taxi driver begins to protest. There’s a very small window of time in which I must convey that it’s illegal for them to refuse passage to a disabled person traveling with a service dog and that his license will be revoked if he does refuse to take us. And, as you might imagine, after one has basically threatened a taxi driver with the loss of his livelihood, albeit quite rightly and legally, it’s not a very pleasant or chatty ride. I’ll stop here, because if I launch into the trouble I had with restaurants in NYC or the way that being discriminated against at the theatre meant me losing out on getting to have Mandy Patinkin sign my Compulsion Playbill, I might cry. 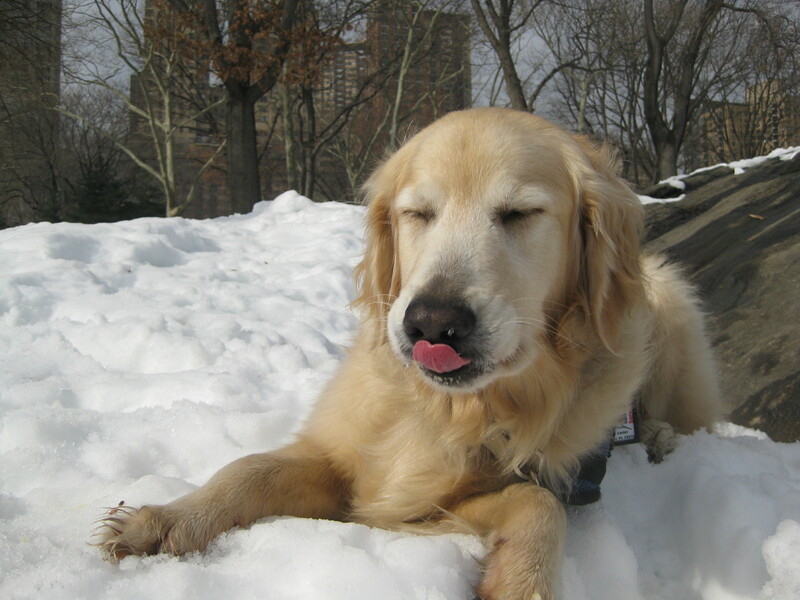 So, in lieu of hysterics, I give you a couple photos of Luke in Central Park. 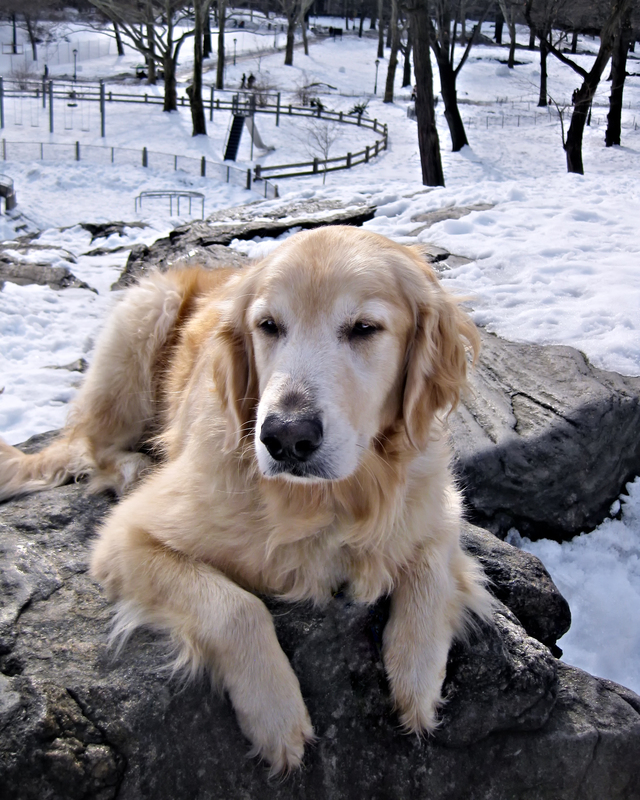 He was already a huge fan of CP, but drenched in an icy white blanket of goodness, he was downright besotted with those hills and trees and trails!